We offer a series of free resources which support groups during their visit to the Gallery. 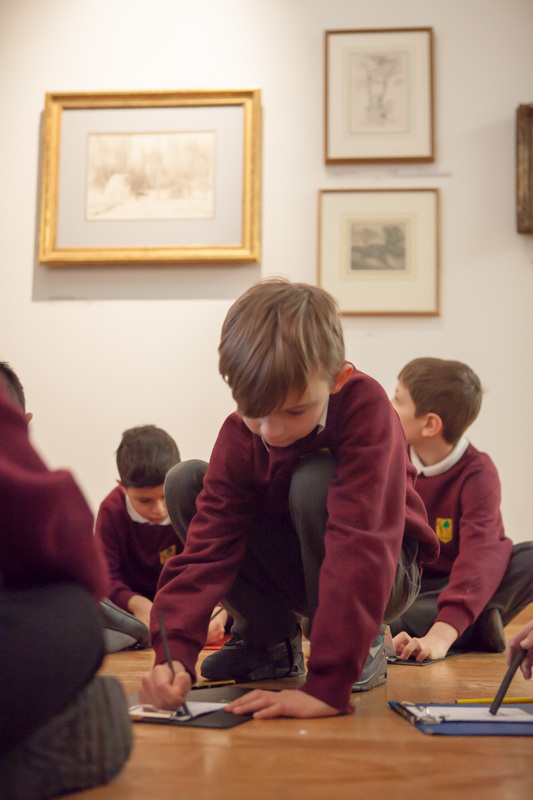 Each activity encourages pupils to engage with the artwork on display, depending on the needs and ability of your group. If you would like to use any of these resources during your visit please request them whilst booking your visit. Please select resources that are suitable for the ages of your children. • Give the pupils 3-5 minutes to look around the galley floor they’re on – Floor 1, 2, or 3. • Give each pupil one red and one green card. Green for Go, Red for No. • Give the pupils another 3-5 minutes to go back with the cards to select their favourite artwork (green card) and least favourite artwork (red card) and place the card on the floor in front of the artwork. • Send a child to find out which artwork has received the most green cards. Send a child to find out which artwork has received the most red cards. • Move everyone to the most favourable piece, voted by the pupils with the green cards, and generate a discussion around this. See below for discussion questions. • Ask each pupil to select a sculpted head in the gallery to recreate in modelling material. Show the pupils how to begin with shape of the head, then use the modelling tools and their fingers to sculpt through such as pinching, moulding, scraping, pressing. • Because they are working in 3 dimensions they need to keep walking around the sculpture to be able to effectively model in 3d. • Show the sculptures on the front edge of a plinth to let everyone see each others. • Please roll the modelling material back into balls and replace in the container suitable for the next group to use. These sets of progressive cards provide information on a selection of artworks in our Collections. Targeted at different Key Stages they include age appropriate questions and facts about the artwork to help your pupils engage with the work. • Ask them to really look at their chosen artwork and think about such things as– what’s going on? What’s the weather like? How do you know what the weather is like? What colours have been used? What does this tell you? What kind of marks has the artist used? What’s the atmosphere? • Set the scene by describing their usual tv mode watching the end of a favourite programme then the weather reports come on. Ask them to recreate a weather report for the landscape painting they have chosen. Select individual pupils at a time and ask them to give a weather report back on their painting – be light hearted – is it a great weekend for gardeners? Do they need to put fleece on their plants tonight? Will we need sun cream in the next few days? Are there any flood warnings to be had? • Give the pupils 3-5 minutes to look around the room. Choose an artwork and get to know that artwork. o Millet, Woman Carding Wool. You could think textile designer, yarn designer, felter, knitwear designer, pattern designer, textile factory worker, period drama actress, cottage industry worker. • Ask each pupil to create a mindmap of their ideas. • Share each others ideas to understand the breadth of careers that are possible from an art education. • Ask them to really look at their chosen animal. Ask them to image they are that animal in the gallery – What is the animal’s expression, what’s their personality, what are they thinking, what mood are they in? Make sure it relates to their animal in their current position in the art gallery. • Each pair of animals are going to have a conversation. How does the personality of the animal impact on what they say? For example the frog in the case could be talking to the cat on the windowsill saying how please he was to be in the shade in the case rather than having the sun on his back like the cat, his biggest problem was having difficulty breathing as the air in the case was running out after all these years….. The conversation is not about making animal noises. • Choose some pairs to present some of the conversations back to the group. Be light hearted, this is great way to get pupils laughing in the gallery. • Imagine you are this person. How are you feeling? Where are you? What has happened to you? Where did it happen? • How could this be developed differently?